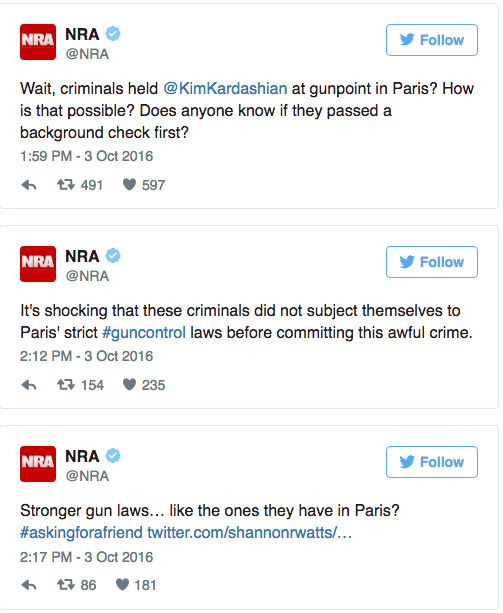 The National Rifle Association (NRA) has something to say about Kim Kardashian West, who was the victim of a robbery in Paris over the weekend. Perhaps unsurprisingly, it is to mock the mother of two for daring to ever speak out in favor of increased restrictions on firearms. The reality star was gagged, bound and held at gunpoint while being robbed of her jewelry during a visit to Paris. According to reports two men dressed as police officers entered her room late Sunday, bound Kardashian West's hands and feet with tape, gagged her and put her in the bathtub before stealing millions of dollars in jewelry, two cell phones and her purse. The French Interior Ministry said five men were involved in the crime, with the group gaining access to Kardashian West’s room by forcing a concierge to let them in, E! News reported Monday. The 35-year-old was "badly shaken but physically unharmed," her representative told E! News. NBC News New York reported Monday that Kardashian left Paris early that morning, flying to Teterboro Airport in New Jersey.